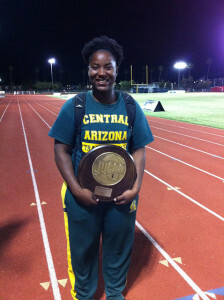 Central Arizona College freshman and British Virgin Islands native Trevia Gumbs erased twin sister Tynelle’s Discus Throw national standard after improving her own Shot Put mark, while Eldred Henry claimed Eric Mathias’ 11 year old Hammer Throw National Record in the Arizona Jr. Colleges Region I Championships, held in Mesa. Their performances helped Central Arizona to comfortable win the women and men’s divisions with 277 and 294 points respectively. After losing to Tynelle in their last matchup to end a streak of three successive victories, Trevia claimed Tynelle’s Discus Throw National Record with her heave of 46.49m upping her best from 43.62 on April 25 in San Diego, Calif. Tynelle added two meters on to her 44.59 from her last outing with a throw of 46.40 to place second. Trevia was coming off a fourth place in the Hammer Throw, that saw her improving her 42.30m BVI record mark to 47.35, while Tynelle, upped her best from 36.82m to 44.99 and finished fifth. Trevia—who bagged U20 Girls Shot Put silver in last month’s Carifta Games—used a 14.24m effort on her fifth attempt to win, while Tynelle’s opening mark of 11.88m was good for third. Tynelle was 2nd in the Javelin Throw with a mark of 38.45m that came in the third round. Strongman Eldred Henry did a bit of hammering as he took down Eric Mathias’ 11-year old Hammer Throw record of 45.51m with his effort of 45.71, increasing his previous best of 41.89m. He placed eight overall and was second in the Discus Throw with a 52.05m measurement on his third attempt. He was plagued by foul trouble in the Shot Put and finished third after an opening throw of 15.86, then fouled the rest of his attempts. Tarika “Tinker Bell” Moses on Wednesday moved to No. 2 on the BVI’s All Time List in the 800m, when she placed second in the Curacao Invitational, in 2 minutes 09.55 seconds—joining Samantha John as the second junior under 2:10.00. Karene King won the 100m in 11.94 seconds while Deya Erickson ran 13.02 as the 100m Hurdles was scratched. After Curacao, King was third in the 200m in 24.25 seconds in Saturday’s St. Maarten Invitational. Ashley Kelly finished fifth in her 400m debut after running 54.74 seconds. Lakeisha “Mimi” Warner brought the curtains down on her Cary High School career with top three performances in the North Carolina State 4A Championships. After anchoring Cary’s 4x800m relay to victory in 9 minutes, 14.45 seconds, Warner ran a 300m Hurdles personal best of 42.51 seconds to place second overall—less than three months after her first competition in the event. She ended the meet with a third leg carry on the 4x400m relay which ran 3 minutes, 50.21 second to finish third, as Cary scored 59½ points and place second.